Flavor-rich pasta sauce made using three types of mushroom, including porcini mushrooms. Simply defrost the sauce in its bag, add to your favorite pasta, and enjoy. 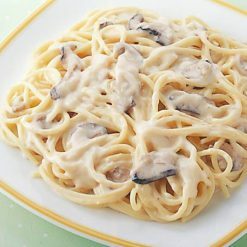 This highly fragrant pasta sauce is made using porcini mushrooms, as well as plenty of fresh cream, cheese, and other dairy products. Porcini mushrooms have a sweet scent and umami flavor. They are used frequently in Italy, and are one of the most popular types of mushrooms. Seasonings such as sauces can be a crucial part of a meal, turning plain food into a delicious experience. After all, sometimes we only think we don’t like certain foods because we haven’t tried them with the right seasoning! Sugarlady’s mushroom cream pasta sauce and other seasoning products are safe and free of chemical seasonings and additives, letting the true, natural flavors of the ingredients themselves shine – and allowing you to enjoy your meal without worry. To boil in bag: Place the pasta sauce (still frozen, still in its bag) in boiling water, and warm for 10 to 12 minutes. Mix with your pasta before the sauce cools, and enjoy.If the bag touches the rim of the pot, or if the bag is sticking out or hanging out of the pot, the bag can melt and develop holes. Please defrost with care. Will be very hot after defrosting; please use caution to avoid burns. 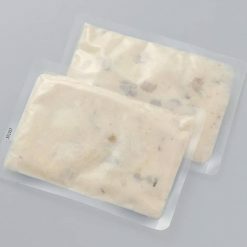 This product contains mushrooms (white mushrooms, shiitake mushrooms, porcini mushrooms), vegetable fats and oils (palm oil, coconut oil), vegetables (onions, garlic), wheat flour, pig fat, natural cheese, sugar, whole milk powder, table salt, cream, chicken bouillon, powdered skim milk, butter, spices, sweetened condensed milk, egg yolk oil, yeast extract, enzymatically hydrolyzed wheat gluten, evaporated milk, cornstarch.. This product is not suitable for anyone with allergies to egg, milk, wheat, soy, chicken or pork. Origin of ingredients: white mushrooms (Indonesia), shiitake mushrooms / porcini mushrooms (China). Prepared and packaged in Japan.